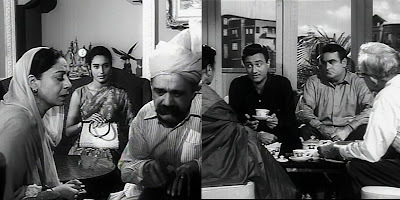 It was one Dev Anand - Nutan starrer, Paying Guest, their first film together - that kicked off this Dev Anand Marathon on this blog. Since all good things must come to an end some time, it seems apt that I end the month with another Dev Anand - Nutan film, this time the last one in which they starred together as romantic leads. Vijay Anand returns to helm a mad romantic comedy, and like all the films I've reviewed so far, the music stands testimony to Nav Ketan's long history of having an excellent musical score. Set in Delhi, the film begins with a government auction. Land is being auctioned off, and eager businessmen, wealthy aristocrats, the nouveau riche, are all trying to get their hands on prized plots at low prices. 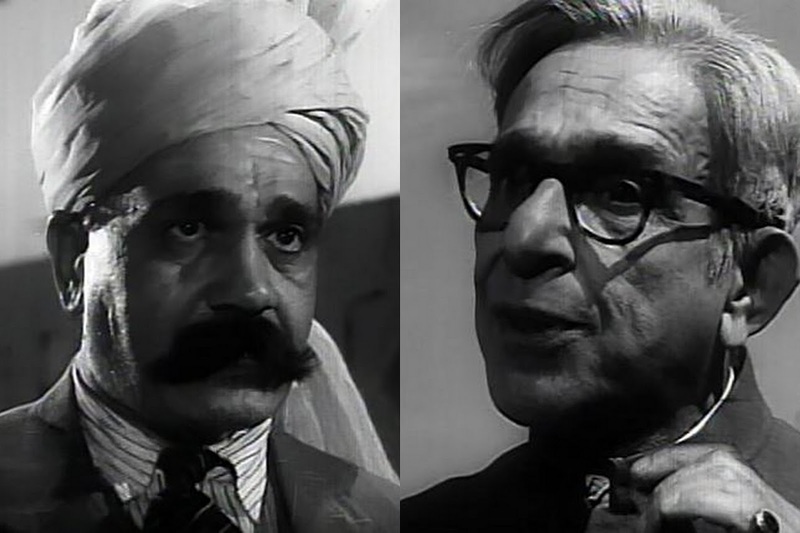 Here, we meet Lala Jagannath (Om Prakash) and Seth Karamchand (Harindranath Chattopadhyay). As Jagannath bids for a plot, one of two adjacent ones, and is almost certain to get it, Karamchand steps in at the last moment to scuttle his bid. Then begins a battle of the titans, with each of Jagannath's bids being silently countered by Karamchand - he keeps raising his hand. (The auctioneer interprets his gesture as increasing each preceding bid by Rs1,000.) Finally, the bidding (which began at Rs70,000) culminates in Lala Jagannath being the proud owner of the land at Rs2,00,000. Karamchand has lost the battle but not the war. The rivalry between him and Jagannath is so virulent that, though he was ready to walk out not having been able to buy the plot he was after, he walks back into the auction again. The bidding opens at a paltry Rs40,000, this lot not being as good as the earlier one, but Karamchand ends the auction by offering an exorbitant amount of Rs2,01,000 just to outshine his rival. Jagannath is astounded - has Karamchand gone mad? Karamchand's wife (Pratima Devi) is equally aghast. So is his daughter, Sulekha (Nutan). Any house they build on this plot will be eclipsed by the house that is built on the plot in front. Eclipsed? queries her father. Or will the other house be dwarfed by theirs? 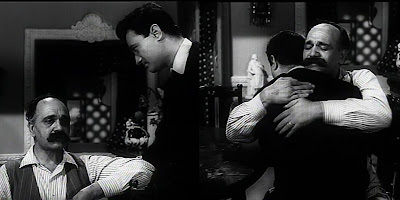 He calls on an old friend, Sukhvir Lal (Uma Dutt) who promises to send his best and brightest to take a look at the plot. Unfortunately, Rakesh (Dev Anand) and his assistant, Madan Gopal Basuriwala (Rashid Khan) are initially mistaken for roadside loafers by Sulekha and her ayah, Motiya (Parveen Choudhary), who are waiting for an 'experienced' architect. Since Rakesh has no clue that the girls are waiting for him, and he's on the lookout for Seth Karamchand anyway, he ignores them, and Sulekha leaves in high dudgeon. Their visit to her home (after her father's called up to complain to Sukhvir that his architect hadn't shown up) also does not go according to plan. Sukhvir offers to have Sulekha come to office the next day and choose whoever she likes. When she reaches the office, Sulekha tells Sukhvir that she'd liked a couple of houses on the way, and that she would like to meet the architect who had designed them. Imagine her consternation when Rakesh walks in. That evening, Rakesh is squiring Ginny (Zarine Katrak), the office receptionist, to dinner at a club, when in walks Sulekha with her brother, Captain Ranjeet/Ronny (Rajendranath). The club restaurant is full, however, and they are about to leave, when Rakesh obligingly offers them seats at his table. Once he's established that Ronny is Sulekha's brother, the ice between him and Sulekha thaws, and by the time they leave, they are the best of friends. Ronnie, attracted to Ginny, wastes no time in inviting Rakesh and Ginny to a picnic the next day. There, the couples quite naturally pair off, Ronny going off with Ginny; with her parents refusing to climb the Qutub Minar, Sulekha is left with Rakesh for company. By the time they come back down the stairs, it is quite clear that she is not quite as indifferent to him. Back in Lala Jagannath's mansion, he has received the map marking his plot of land and is wondering whom he should hire to construct a house on it. His wife (Mumtaz Begum) tells him that if the house is only for him, then she doesn't care who builds it, but if she has any say in the matter, the only person who will build it will be her son. Husband and wife have an acrimonious conversation, where it is clear that Rakesh (who else?) is their son, and that the Lala has disowned him because of his drinking and smoking and carousing. And whose fault is that, snaps his wife. Hadn't she begged him not to send their only son abroad? And it is not as if he is drinking tharra (country liquor); he drinks excellent whiskey and he certainly is not drunk. But if her husband continues to be recalcitrant and insist she meet her son outside, then, well, she will never come back in. However, it is very clear that Jagannath is more hurt than angry at his son's continued absence. There is enough pride and obstinacy to spare on both sides. Rakesh has to be emotionally blackmailed by his mother into going and making peace with his father. Reluctantly, but because he loves his mother deeply (and his father as well), he does. That one gesture is enough to melt his father's heart. The next morning, the proud Lala takes Rakesh along to show him his new acquisition. His only requirement is that their house must make that on the adjacent plot look like donkey droppings. Later, Sulekha takes Rakesh out to show him their plot. All she wants him to do is to build them a house that completely overshadows the house in front. A beleaguered Rakesh tries to back out of making the second house. He won't be able to build one quite as good, he explains. In answer to her astonished query, Rakesh replies that if that other architect is 'his father's son', then he is definitely a better architect than Rakesh, and if he, Rakesh, is better than the other architect, then he (Rakesh) is not his father's son. With that cryptic utterance, he takes leave of a completely perplexed Sulekha. The next morning, a Sunday, while Rakesh and his parents are at the club, Ronnie enters with his entire family in tow. A discomposed Rakesh hurries Ronnie off to the bar, where Sulekha joins them. Outside, the two fathers are left glaring inimically at each other. When they return, with Ronnie more than slightly tipsy, Rakesh is hard put to keep his father and Seth Karamchand from guessing how he knows the other. A few judicious white lies (and some dramatic acting) settles the matter - for the moment. Seth Karamchand leaves the design of their new house to Sulekha and Rakesh. As they finalise a design, Rakesh is told of his father's arrival. He gets Madan to (try and) put his father off by saying that Rakesh is in conference with a Maharani. Soon, Rakesh finds himself digging a deeper and deeper hole for himself. Nothing he tells his father changes the old man's mind about wanting that very same design for their house. Oh what a tangled web we weave...! Which is a rather satisfying ending, only the day hasn't quite ended yet. It leads to serious consequences for Sulekha, who had called her angry mother to let her know that she's been delayed at a friend's house, but had forgotten to ask the friend whom she is supposed to be with to cover for her. Her furious parents send her away to Shimla, from where Sulekha sends Rakesh letters (while Motiya writes letters to Madan). Meanwhile, back in Delhi, the construction of both houses is going on at full swing. Rakesh makes an attempt to get the warring patriarchs to forget their enmity and be friends, but fails spectacularly. Poor Rakesh is missing his Sulekha very much, and when later that night, at the club, he begins to see her everywhere, even inside his glass of whiskey, he decides the separation is too much to bear. Besides, hadn't Sulekha asked if he could come to Shimla? In his haste, he forgets to take the address. All he knows is that they have a residence on Mall Road. A humorous passer-by tells him to 'keep enquiring as you go along'. So begins Rakesh's musical quest to find his beloved. Her smile lights up the night. The next morning, however, Sulekha's watchful mother throws a spoke in the wheel of their romance, but between Rakesh and Sulekha, they manage to send Motiya away. An exhilarated Rakesh drives madly around the winding roads of Shimla, much to Sulekha's perturbation. What she fears comes to pass as the scooter skids off the road. An irate Sulekha is in no mood to be coaxed out of her anger. Well, not so quickly anyway. The rift in the lute is not to be repaired for too long - Rakesh tells her the truth. Well, part of it anyway - that he's the architect of the house on the adjacent plot as well. Sulekha, really furious at this deceit, leaves him behind and returns home, having wrangled a lift from a passer-by. Soon, she receives a letter from her father saying that Rakesh has summarily refused to continue work on their house. Her father has asked that they return to Delhi so they can find a solution. Sulekha is now puzzled as well as angry. She cannot fathom why Rakesh has not come to apologise to her, and to promise her that he will not build her father's rival's house. Rakesh asks her why he should - what are they to him that he has to leave another client's project incomplete in order to complete theirs? Sulekha is beyond furious now. So they are nothing to him? Then who is that ghoosat, muchhad Jagannath ka bachcha that Rakesh loves him so much? Rakesh's and Sulekha's love story may have derailed right here, if it weren't for the fact that Ronnie is back again on furlough. It's his birthday and he wants Rakesh to squire Ginny to their house in the evening. At the party, Rakesh is importuned to sing, and he does so - straight from the heart. It does much to soothe Sulekha's wounded feelings. Now it is just a matter of her parents approving of him, and his parents approving of her. Or is it that simple? What will happen when the warring fathers see that Rakesh is playing a deep game and that their houses are mirror images of each other? What will they do when each realise that their child is in love with their enemy's offspring? Vijay Anand's direction was perfectly pitched, and the zany comedy did not get out of hand (until the very end). 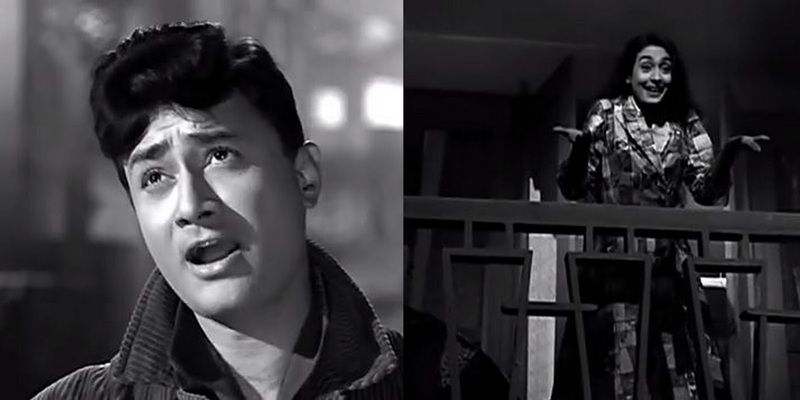 Dev Anand had turned 40 when this film was made; he looked 30. Nutan had just returned to films after giving birth to her son, Mohnish. Together, they made a fabulous pair, so comfortable with each other, so at ease, much more so than in Paying Guest. Nutan was incandescent, and Dev was at his charming best. He had a genuine flair for comedy, and this film, again, is one in which his trademark mannerisms didn't make an appearance. His Rakesh is independent, modern, and has a sense of responsibility. He balances the demands of the old and new with estimable empathy, and despite seeming quixotic, tilts at the windmills of the fathers' stubborn hatred. I like that he reads the riot act to both fathers, and is quite willing to walk out with his Sulekh when they prove obdurate. Nutan played her Sulekha well, supporting her beloved in the quest to gain their parents' blessings for their marriage. She is very clear that without that obstacle being cleared, they will not be happy. Yet, she is also willing to stand up to her father and fight for her love, instead of just bowing her down to parental diktat. 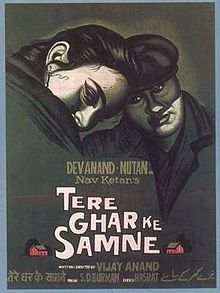 Tere Ghar Ke Samne was the last Nav Ketan film to be produced in black & white. (Nav Ketan's next film would be the colourful, musical journey of Raju Guide.) SD Burman provided us with a cornucopia of good songs, the best of which I have linked to in this post. Vijay Anand showed us how good he was at actually creating piquant song situations. Dil ka bhanwar was partly shot in the Qutub Minar - all the outside shots were of the actual monument itself, and a few of the inside shots as well. 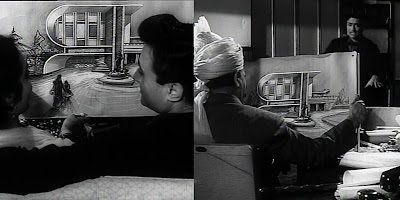 The space was too cramped, however, to shoot extensively inside, so a good part of the song was shot on sets that replicated the monument, and mixed at the editing stage. I have written extensively about Tere ghar ke samne before; it is interesting to see Rakesh imagine Sulekha standing inside his whiskey glass as he promises her that come what may, he will build his house in front of her home. As Madan drops an ice cube into the glass, she shivers, as she pleads with Rakesh to take it out; she's cold. 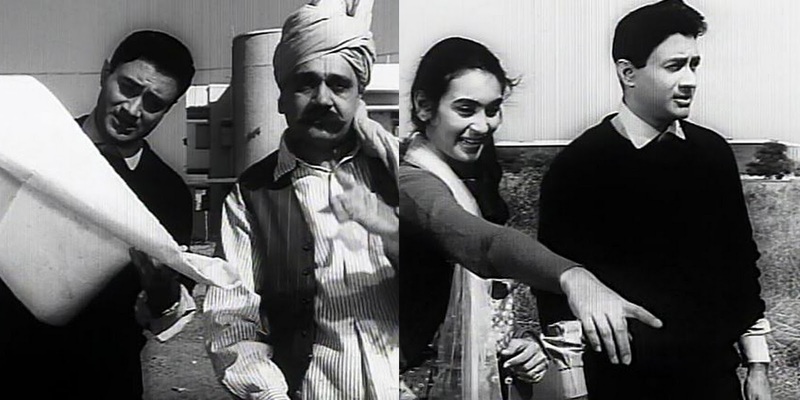 Tu kahan ye bata is my favourite song from this film. To me, this song and Abhi na jao chhodkar (Hum Dono) are the ones that come immediately to mind when I think of Dev Anand and romance. It is full of joy as he searches for his beloved, and there is such happiness visible in his face (and hers) when he finally finds her. 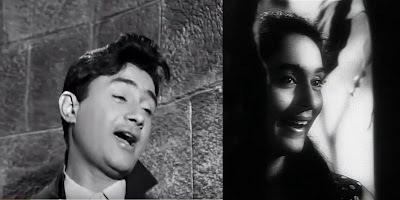 The misty night, Dev Anand's goofy charm, Mohammed Rafi's mellifluous voice and Nutan's luminous smile - it's sublime. Rajendranath had a role where, for once, he was not required to be over the top, and consequently wasn't as painful as he usually is. I really liked the scene where he asks Rakesh if Rakesh thought that his (Ronny's) father would agree to his marrying Ginny. But he was going to marry her anyway. He suggests that Rakesh take his sister Sulekha and elope because neither of their fathers are going to listen to reason. I loved the fathers as well. Om Prakash plays the choleric Lala Jagannath, with a touch of humour. (Think of all his insults - 'aalu bukhara', 'ainakwala akrut' 'gutter gu' 'peda banaoonga'.) He is hot-tempered, but has a kind heart, and he loves his son deeply. 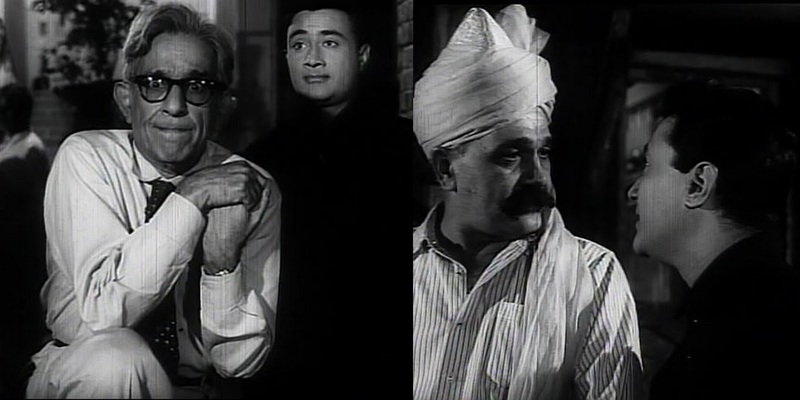 Harindranath Chattopadhyay plays the bilious Karamchand. He too loves his daughter deeply, but his pride and ego will not allow him to be bested by a man he considers beneath him. It is their clash of hurt pride that drives the young couple apart. Like most of Nav Ketan's films, this too dealt - lightly - with social issues - the gap between the young and old, between old and new, between traditional conservatism and modern liberal ideas. As Sukhvir points out to Sulekha at the beginning, don't confuse experience with old, wizened appearances. It is not necessary that a young man does not have the experience or cannot do a good job. On the contrary, he might have new ideas that can blow the cobwebs away. When later, Sulekha tells Rakesh that she's sorry, but she cannot marry him without their parents' blessings, he tells her they know five facts - 1) That her parents love her. 2) That his parents love him. 3) He loves her. 4) She loves him. 5) Deep inside, her parents love him, and his parents love her. It's just a matter of making them see that. The plea for love and liberalism does not mean taking a sword to the bastion of conservatism and hatred (not that they are mutually inclusive). It does mean that to attain something, they have to work harder towards that goal. In a film directed with such a light hand, it wasn't necessary to have the angst notched up so high at the end. One can forgive much, however, when all the other songs were so beautifully and imaginatively picturised, and the direction does not falter one bit in building up the light romance. Tere Ghar Ke Samne is the perfect rom-com for a rainy afternoon. So, if you haven't already, do watch. If you have, well, revisit the lovely romance of a pair who make you care what happens to them. Trivia: Director Vijay Anand made a cameo appearance in the Dil ka bhanwar kare pukar song. He's the man going up while Rakesh and Sulekha make their way downwards, catching them at an embarrassing moment. Ginny was played by Zarine Katrak, whose only film appearance this was. She is better known as actor-director Sanjay Khan's wife.